How to share folders in Google Docs? Google Docs helps you to create and edit web-based documents, spreadsheets, and presentations and store them online and access them from any computer. Now Google Docs has also enabled storing folders or sharing folders which have a number documents in them. 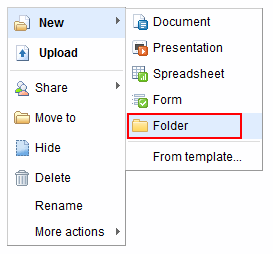 In this article we will tell you how to share folders using Google Docs. 1. Open your Google Docs account. 2. In the left menu column you will now see a new option called My Folders. 3. In order to create a new folder, go to a white area and right click, from the drop down menu select Folder. 4. Now give a name to your Folder. 5. In order to put documents into the folder just drag and drop your all ready existing document(s) into the newly created folder. For more illustrations you may see this and this.